with smart DO IT YOURSELF-KIT. 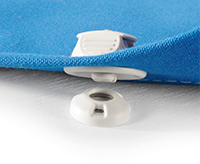 NO PINS but smooth, round fixing points that prevent cloth damage, snagged ropes or even injury. PERFECT GRIP even with cold and wet fingers. DURABLE and corrosion free. For the toughest conditions, but also UV-stabalized. COLOUR MATCH sold separately, one can have any combination of button in fabric and receiver on deck.